I hope Nikki won’t mind, but I decided that for my blog post this fortnight, I would review her book that just recently came out. I love you, Nikki, and I’m so happy for you that your book got published. Plus, I thought it was a delight! Clean rating: G. Super duper clean. 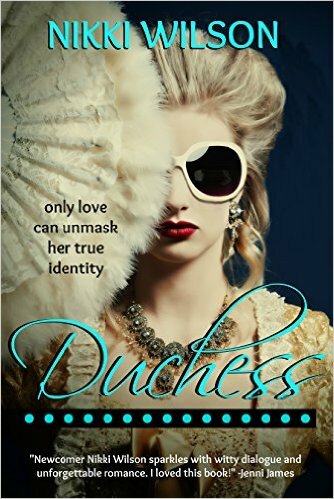 Short summary: Katie is the manager for a major pop star, Duchess, but what people don’t know is that she also is Duchess. Chase is a veteran who is asked to help put together a charity concert with Duchess as one of the stars, so he has to work with Katie. Of course the inevitable craziness ensues when she tries to hide her identity and Chase tries to figure her out. Recommend it? Are you a fan of light, clean, contemporary romance? Then yes, I recommend it. It was a fun read with a premise that was pretty amusing (imagine trying to be both a pop star and the pop star’s manager—what a pain!). There was also some seriousness—Katie’s mom is very sick with cancer, and Chase still suffers from PTSD and from some things that happened when he returned home—but it was handled gently so it didn’t feel heavy or depressing. What I liked: I most enjoyed the situations that arose from Katie’s predicament. While I don’t really know about whether the situation is all that realistic (it probably isn’t), I didn’t care. It doesn’t matter whether or not this would work in real life. What matters is that Nikki sold it as believable in her world. It was funny, and I could feel Katie’s tension as she tried to navigate the different relationships she had, not telling anyone about Duchess. I also enjoyed the developing relationship between Katie and Chase. For me there was a nice level of tension, and I very much enjoyed that it was romantic but never crossed any lines. Plus, I really liked the cover—I thought it captured the essence of the story very well. What didn’t work for me: This is a personal thing, but I rarely like reading song lyrics and poems within a book. I can rarely do them any justice in my head, and I wind up not enjoying them. So I would have preferred less of that, but your mileage may vary. I also had a few times when I wanted to tell Katie that she was being unrealistic about her mom’s prognosis and she needed to behave a little better. On the other hand, I think that those of us who truly believe in life after death tend to have a much easier time with death, so maybe I’m being too harsh? Last words: Go buy it! Not only is it very inexpensive, and not only will you be supporting our very own awesome Nikki, but most of all you will be getting a fun romantic story out of it! Yay! Thank you so much for your awesome review!! I just saw this and it made my day!